This year our Primary has been challenged to learn all 13 Articles of Faith. I learned these (up to Article 6) when I was young, but have never memorized the entire set. Our family is going to work on it together. So I am working on (and will be sharing) word posters to help with memorization. Here's is number One. To see all available Article of Faith posters CLICK HERE. *IMPORTANT NOTE: The church handbook discourages use of pictograms like these for memorization in church. These should be used for HOME USE ONLY. For more information click here. Thank you! This is darling! loves this for my kids! thanks! That's awesome! Thanks for posting this! I think we now have a new family goal-- learn the Articles of Faith! My daughter and her family are following your FHE plans this year and you make it so easy to WANT to do it. Aw, this is wonderful! I am going to print this off and add it to our FHE time. Ps--we did our lesson tonight that you posted yesterday. The kids LOVED the All About Me book! So fun. You are the best! this website is the best thing in the world!! i usually don't comment on blogs, but i just wanted to say thank you for all of your awesome ideas and your printables and all. i have a 3 year old and 1 year old and fhe ideas are challenging but this website will definitely help A LOT! thanks! I've been surprised that I actually do have them all memorized as long as I sing the songs. We sang all 13 in a row in Primary last week and I didn't have to look at any words for the entire thing. Go me. Thank you SO much! 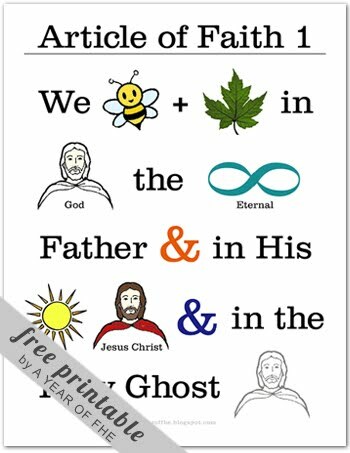 These are wonderful for teaching young children and will be great to use for Faith In God requirements! I'm Pinning this! Amazing! Thank you for this wonderful tool. One of our family goals this year is to have my 4 year old triplets memorize the articles of faith. Thanks for making it easier for all of us! I can't wait for the others to come! I have 3 kids, and I used this tonight with scripture time. My 5 year old, and 2 almost 3 year old LOVED it. They wanted to say it over and over! Thanks so much keep them coming! It was a hit! Thank you. I'm using this with my five year old primary class today! First, Thank you for all you do to help make my life easier:) ha! Secondly, we are doing the Articles of Faith in a different order in Primary this year, is there a way to print them off, not in order? Thanks!! Thanks! I'm excited to use it with my kids! Thank you! I am going to use these with my family and my activity day girls for their Faith in God requirements to memorize the Articles of Faith! Thank you Thank you !!! Our family has set this goal also, now we have no excuses!!! these are awesome! I have the same question as others..Is there a way to get all 13 in this format with the words and pictures! This would be awesome for primary where there is not junior and senior! Love the printable posters! Thank you for these! I'm gonna start teaching them to my kids for FHE and this is awesome. THANK YOU! THANK YOU FOR YOUR WONDERFUL WEBSITE! This will help my children a lot. Thank you for your work in making these and sharing them for FREE!! We have a goal for our family to memorize The Article of Faith. Our four year old has been soaking these up like a sponge! He can recite the 13th Article of Faith now!!!! Thank you for making these and making them available. I'm using them for my children with autism. Pictures work wonders for them and I know it will be great to teach them the articles of faith! Thank you for using your time and resources to make these! However, I tried downloading the docs and they seem to be taken down. Thank you so much for all your hard work on these! Discover How To Become A Better Singer ..
Over 10,000 Singers – Including Professionals, Recording Artists and Even Total Beginners – Have Used The Superior Singing Method To Experience Vocal Breakthroughs . Is there an update for these downloads. It keeps showing a blank page for me.